Human evolution used to be depicted as a straight line, gradually progressing from an ape-like ancestor to modern Homo sapiens. But thanks to next-generation sequencing, findings in recent years have shown that it wasn't quite so orderly. 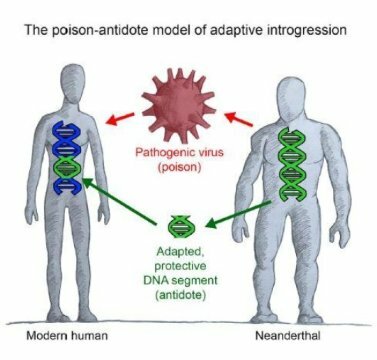 Now, a new study is reporting new details about the role of viruses in shaping evolution, in particular viral interactions between modern humans and Neanderthals. BHuman evolution used to be depicted as a straight line, gradually progressing from an ape-like ancestor to modern Homo sapiens. But thanks to next-generation sequencing -- as well as the discovery of genetic material from extinct subspecies of early humans -- findings in recent years have shown that it wasn't quite so orderly. The human family tree is full of twists and branches that helped shape what we are today. Now, a study published in the journal Cell is reporting new details about the role of viruses in shaping evolution, in particular viral interactions between modern humans and Neanderthals. "It's not a stretch to imagine that when modern humans met up with Neanderthals, they infected each other with pathogens that came from their respective environments," says first author David Enard (@DavidEnard), an assistant professor in ecology and evolutionary biology at the University of Arizona. "By interbreeding with each other, they also passed along genetic adaptations to cope with some of those pathogens." Current thinking is that modern humans began moving out of Africa and into Eurasia about 70,000 years ago. When they arrived, they met up with Neanderthals who, along with their own ancestors, had been adapting to that geographic area for hundreds of thousands of years. The Eurasian environment shaped Neanderthals' evolution, including the development of adaptations to viruses and other pathogens that were present there but not in Africa. The Cell study provides new details about the role of adaptive introgression, or hybridization between species, in human evolution. "Some of the Neanderthals had adaptive mutations that gave them advantages against these pathogens, and they were able to pass some of these mutations on to modern humans," explains Enard, who completed the work while he was a postdoctoral researcher at Stanford University. "That's called positive natural selection -- it favors certain individuals that carry these advantageous mutations." Enard and Dmitri Petrov (@PetrovADmitri), the Michelle and Kevin Douglas Professor of Biology at Stanford University and senior author of the new study, use bioinformatics tools to study global patterns of evolution across tens of thousands of years. Their earlier research focused on how viruses impacted the evolution of humans. In 2016, they reported that about one-third of protein adaptations since humans split from other great apes was driven by a response to infectious viruses. The new work built on those findings looked at which of those adaptations may have come from Neanderthals. In the current study, the investigators annotated thousands of genes in the human genome that are known to interact with pathogens -- more than 4,000 of the 25,000 total genes. "We focused on these genes because the ones that interact with viruses are much more likely to have been involved in adaptation against infectious disease compared with genes that don't have anything to do with viruses," Enard says. They then looked at whether there was an enrichment of stretches of Neanderthal DNA in those 4,000 genes. Earlier studies from other groups have shown that Neanderthal DNA is present in humans. Those sequences are publicly available to investigators in the field. Based on the analysis, Enard and Petrov found strong evidence that adaptive genes that provided resistance against viruses were shared between Neanderthals and modern humans. "Many Neanderthal sequences have been lost in modern humans, but some stayed and appear to have quickly increased to high frequencies at the time of contact, suggestive of their selective benefits at that time," Petrov says. "Our research aims to understand why that was the case. We believe that resistance to specific RNA viruses provided by these Neanderthal sequences was likely a big part of the reason for their selective benefits." "One of the things that population geneticists have wondered about is why we have maintained these stretches of Neanderthal DNA in our own genomes," Enard adds. "This study suggests that one of the roles of those genes was to provide us with some protection against pathogens as we moved into new environments." In addition to revealing new details about human evolution, Enard notes, another benefit of this type of research is that it will help investigators uncover new clues about ancient disease outbreaks. This could potentially inform better ways to monitor for and treat future epidemics. "RNA is very fragile and gets degraded fast, so it's hard to learn much about ancient diseases that were caused by RNA-based viruses," he says. "You can think of these genetic adaptations like footprints from long-extinct dinosaurs preserved in fossilized mud. Even without having access to the viruses themselves, scientists who study prehistoric epidemics will be able to learn about the pathogens that drove them." This research was funded by the National Institutes of Health.